While any serious injury can be traumatic, a traumatic injury to the mouth can affect your breathing, eating, talking and facial function, often causing pain, discomfort and a drastic lifestyle change during recovery. In addition, a serious mouth injury often affects more than just your teeth, as gums, facial tissue, your tongue and jaw can be involved as well. 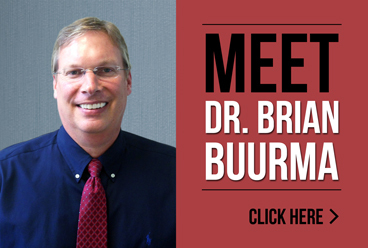 Dr. Buurma specializes in treating traumatic injuries to the mouth and surrounding area, and can help you get back on the road to recovery and normal function. If your dentist suggests endodontic treatment for your traumatic injury, our caring and knowledgeable staff will work with you to find the best treatment option and help you return to the way things were before your injury. Pick up the tooth by the chewing surface, not the root. Handle it carefully. Reposition the tooth in its socket immediately. The sooner the tooth is replaced, the greater the likelihood it will survive. To reinsert, carefully push the tooth into the socket with the fingers, or position above the socket and close mouth slowly. Hold the tooth in place with fingers or by gently biting down on it. The tooth must not be left outside the mouth to dry. If it cannot be replaced in the socket, put it either in milk, in your mouth near your cheek or in water with a pinch of salt. Bring the tooth to a dentist or Endodontist as soon as possible, ideally within 30 minutes. However, it is possible to save the tooth even if it has been outside the mouth for an hour or more. This procedure is used to make the end of a tooth root close in a traumatized tooth with healthy pulp. Your dentist will cover the exposed pulp area with medication to encourage complete root growth. The tip of the root will continue to close as the child gets older. In turn, the walls of the root canal will thicken. If the pulp heals, no additional treatment will be necessary. The more mature the root becomes, the better the chance to save the tooth. This procedure is used to make the end of a tooth root close in a traumatized tooth with unhealthy pulp. In this case, the unhealthy pulp is removed. Your dentist will place medication into the root to help a hard tissue form near the root tip. This hardened tissue provides a barrier for the root canal filling. At this point, the root canal walls will not continue to develop, making the tooth susceptible to fractures. So it is important to have the tooth properly restored by your dentist. If you have suffered a traumatic injury, Dr. Buurma and his staff can help you understand your options and choose the best solution for your recovery. For more information about Brian Buurma DDS or root canal retreatment, please contact our office or call us directly at 616.994.9722.